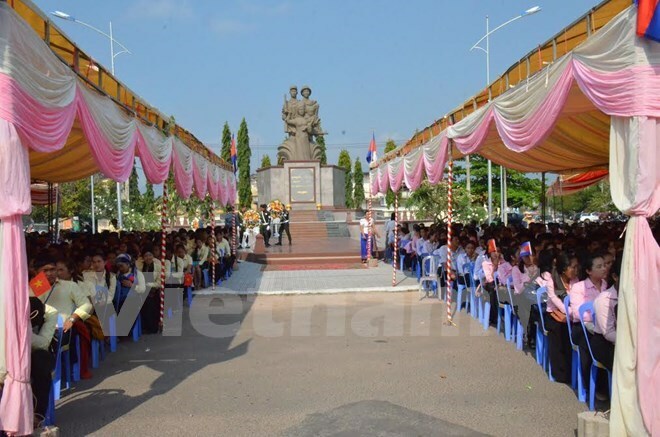 Phnom Penh (VNA) – A monument to Cambodian and Vietnamese martyrs was inaugurated in Cambodia’s Kampot province on March 11. Min Khin, Vice President and General Secretary of the National Council of the Solidarity Front for the Development of Cambodia’s Motherland, said that the restoration and embellishment of all Cambodia-Vietnam friendship monuments in Cambodia was agreed upon by Cambodian Prime Minister Hun Sen and President of the Vietnam Fatherland Front Central Committee Nguyen Thien Nhan in late 2013. The Solidarity Front for the Development of Cambodia’s Motherland and Vietnam’s Defence Ministry were assigned to make a plan for the work, which was signed in April 20, 2015. The inauguration of the monument in Campot is part of the agreement. Min Khin thanked the Vietnamese Party, State, Government, National Assembly, soldiers and their families for helping Cambodia escape from the Pol Pot genocidal regime on January 7, 1979.